Learn about our newest products, software updates, and other compelling topics in education. Joining a webinar is a fantastic way to hear from our authors, listen to other educators, make a comment, or ask a question. Let's face it, it's difficult staying up-to-date with QuickBooks software changes, teaching students of varying technical and accounting abilities, while also knowing what the best resources are and how to use them. Labyrinth author Pat Hartley believes that running a successful classroom shouldn’t be a chore, which is why she’s developed a presentation of some of her best teaching tips, developed through years of classroom trial and application. Are you considering teaching QuickBooks Online in addition to the desktop version, or instead? We have a solution for you! Following the same great instructional design, our QuickBooks Online Comprehensive textbook can provideChallenges and benefits! Pat Hartley shares her knowledge, demonstrates best teaching practices, and provides valuable insights for effectively teaching QuickBooks Online. WATCH this webinar to learn about the content and exercise progression used in this book, and how we deal with the benefits and challenges of using the cloud based version of QuickBooks Online. Introducing our most engaging solution yet for your introductory computer course! This is a complimentary webinar approximately 45 minutes in length, plus Q&A. Excel for Accounting - New Title! Join us to learn about the NEW Microsoft Excel for Accounting provides the ideal blend of accounting principle coverage and detailed step by step instruction on using Microsoft Excel. This unique solution offers a sequential progression of material for both accounting and Excel topics while simultaneously offering a wide variety of exercises that students can use to perfect the associated concepts and skills. Students are also taught how to apply their newly acquired Excel skills to solve real-world accounting problems. Thank you to all the educators who participated in our webinar! You can now view a recording of our live session by registering at the link. The video will begin to play right away. Overview of Table of Contents. Demonstrate the unique blend of accounting principles and Microsoft Excel instruction. Both the accounting principles and Excel topics are presented in a logical sequence, progressing from basic to advanced. Review our approach where concepts are practiced after being introduced using detailed, step-by-step instruction. Courseware designed for today's students. See the difference it makes. 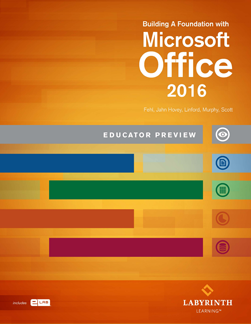 Watch this 60 minute session that covers both our new Office 2016 content and the eLab automated assessment tool. Register now to start the video recording of this webinar. Get the most from your eLab tool - right from the start. In this eLab webinar we will demonstrate the features of eLab and help answer instructor questions as you explore eLab as an integrated part of Labyrinth Learning solutions. We do not have any scheduled webinars at this time. Please email us and we will provide you with complimentary eLab access and a preview.